The wicket has sparked friction across the international game — but one image shows even legends of the sport have been caught up in the wrong debate. Spinner Ashwin took the bails off at the non-striker's end while England batsman Jos Buttler was backing up, with the controversial move overshadowing his side's 14-run victory over Rajasthan — and the IPL return of Aussie Steve Smith. The term "Mankad" — used when a bowler runs out a non-striker before delivery — was coined 70 years ago when Indian allrounder Vinoo Mankad twice ran out Bill Brown at the bowler's end during India's tour of Australia in 1947. While legends, including Shane Warne and England captain Michael Vaughan, have declared publicly they are affronted by Ashwin's failure to act within the so-called "spirit of the game" — the emotion has simply clouded the issue. The freeze frame shows that on simple rules alone — completely independent of those screaming for blood over Ashwin's poor form — Buttler should never have been given out when the decision was sent up to the third umpire. In accordance with MCC Law 41.16 — which governs the non-striker leaving his or her ground early — Buttler should never have been given out as he is allowed to leave his crease "when the bowler would normally have been expected to release the ball". Ravi Ashwin went were few bowlers dare to go. Photo / Twitter. 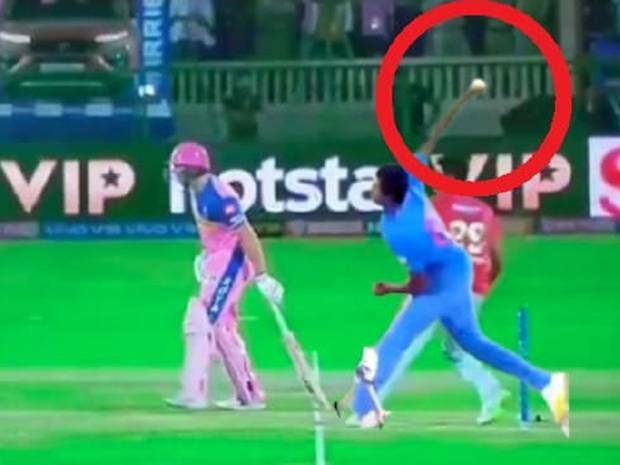 International cricket legends, led spiritedly by Aussie great Dean Jones, have declared the image above is made redundant because Ashwin was never truly in the act of bowling — as suggested by his left arm never pointing down the pitch. It was the second time he has been dismissed via the controversial Mankad — he was also run out in a similar fashion after two warnings by Sachithra Senanayake while playing against Sri Lanka in 2014. Aussie legend Warne led the public calls for the BCCI — Indian cricket's governing body — to make a public stand against the dismissal and to suspend Ashwin. Vaughan said Ashwin's actions were unacceptable. "If @josbuttler had been warned well that's fine... if he hasn't and it's the first time I think @ashwinravi99 is completely out of order... watch how often this happens from now on," he wrote on Twitter. Archer wrote of Ashwin: "You show no confidence in yourself or your bowlers to get the job done so you resort to that ? #greatcaptaincy". Buttler looked to be cruising towards a successful run chase with 69 runs from 43 balls — but that's when Ashwin's dismissal turned the game, and the cricketing world, on its head.